Your six-month dental checkup is one of the most crucial steps towards a healthy smile. So many oral health conditions can be reversed or treated in a minimally-invasive manner if caught early enough. That’s why making regular preventative care appointments helps to reduce the need for costly treatments in the future. What’s Involved in Your Ongoing Care? Our hygienists use particular instruments to safely remove calcified tartar deposits and plaque biofilm from hard-to-reach surfaces across your teeth. These areas of buildup harbour bacteria that promote gum infections and decay, so regular cleans are crucial to keeping your mouth healthy. If you have signs of gum disease (such as bone loss and receding gumlines), a therapeutic deep clean will be needed instead. Your past dental experiences and current health conditions play a crucial role in your ongoing dental care. Certain medications or a diagnosis can directly affect your gum health, the risk for decay and oral health status. To provide the best ongoing care possible, we should be made aware of any medical changes or drugs (including prescription, over-the-counter or recreational) being used. All of your information is kept confidential. Low-radiation digital images allow us to see areas in and around your teeth that aren’t visible during an exam. Bone loss, abscesses and cavities are just a few things that we’re looking for. Although you may not be able to tell, your smile can significantly change from one checkup to the next. During your exam, we’ll evaluate key areas to intercept concerns as they arise. Some of the things we look for include cavities, tooth wear, oral cancer, sleep apnoea symptoms, ageing restorations and periodontitis. 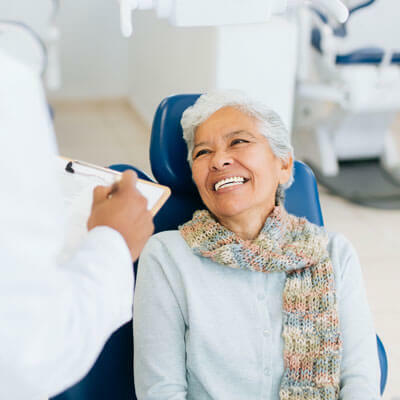 Daily care is the most essential part of reducing your risk of tooth decay, gum disease and protecting the integrity of your dental restorations. We’ll discuss specific areas throughout your mouth that may require special tools or techniques to keep them as clean as possible. If your current oral health status is impacted by concerns such as tooth decay, TMJ pain, ageing restorations or other complications, we will discuss the best method to manage them. When possible, we will present you with all viable options and discuss the advantages or disadvantages of each. We want you to feel confident knowing you’ve made the most informed decision about your oral health. Most people with healthy smiles tend to accumulate calcified deposits on their teeth, which need to be cleaned off regularly. Six months is the typical amount of time between checkups for your mouth to be kept at the highest level of wellness. If preventative cleans and maintenance aren’t enough, such as in instances involving gum disease, we will need to see you more frequently. Contact us today to book your six-month continuing care appointment.